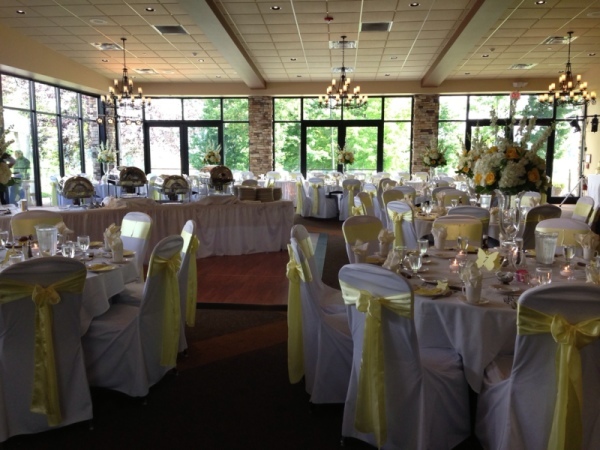 "Personalized Service and Exceptional Value in an Elegant Golf Club Setting"
Thank you for considering Ravenwood Golf Club for your Wedding Day. We realize that this is a special time in your life and our experienced staff will work diligently to provide you and your guests with a day to remember. We pride ourselves in customizing each wedding to suit the bride and groom's desires. The room that we host our receptions in is a Newly Renovated 3,600 square foot Banquet Room that overlooks a breathtaking landscape of our championship golf course. This room has sliding glass doors which can be opened up to the adjacent garden with a lighted waterfall.